The Everest - will he or won’t he? Star three-year-old Trapeze Artist’s future remains a mystery - go to stud or race on - after claiming his third Group 1 this season in the $600,000 Schweppes All Aged Stakes (1400m) at Royal Randwick. Owner Bert Vieira has said he’ll confirm the colt’s future early in the week but admits he’d love to be a part of the hype and fanfare of the second running of The Everest, worth $13 million in 2018. “No idea, obviously I’ve had a lot of offers. I wish I knew,’’ Vieira said. “I will settle it down this weekend and make some firm decisions by Monday. I would love to race him in The Everest to be honest. 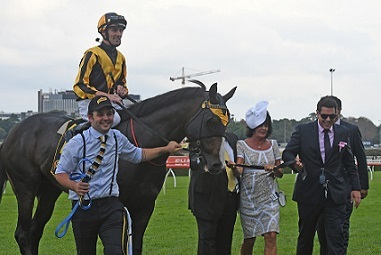 Trapeze Artist not only proved he is a serious racehorse in beating the older horses for the second time in a fortnight at Randwick but he did it in track record time for the 1400m. The colt stopped the clock at 1:20.33, shaving 0.01 seconds from the previous mark held by Solicit who was also trained by Gerald Ryan. Vieira is a heart on the sleeve character who would revel in the build up to an Everest and he went through a range of emotions as Trapeze Artist went stride for stride with Le Romain before sticking his head out when it counted. “He had it, he lost it, he had it, oh God he’s got it,’’ Vieira said. After the TJ Smith win two weeks earlier where Trapeze Artist downed reigning Everest hero Redzel trainer Gerald Ryan said he’d love to see the colt race on at four and his position hasn’t changed. Ryan prepared Deploy for the Everest in 2017 and also has Menari in the mix for one of the 12 slots – none of which have been confirmed as yet. “I’d like to see him keep racing. Like to come back for an Everest,’’ Ryan said. “He’d be sensational in that. There are a lot of dollars involved. Trapeze Artist and strapper Sam Phillips return after the All Aged Stakes. (Pic: Steve Hart). Jockey Tye Angland has been vocal about Trapeze Artist being an ideal horse for the Everest, Vieira said as much after the race. Angland rode Fell Swoop in last year’s Everest and has now had four rides on Trapeze Artist for three Group 1 wins and was bullish going into the race that he could put two big efforts together. “I said to Bert before we went out that we’ve got an Everest to win first and he told me I don’t think I have a good enough jockey and I said to him ‘I’ll show you now’,’’ he said.